The bullish momentum for the spot gold price continued yesterday which saw the gold trading session add a further up bar to the present chart formation, confirming the positive sentiment in the gold market once again. Yesterday’s closing price of $1190.20 saw the spot gold price close above both the 9 and 14 day moving averages further confirming this sentiment which has continued in this morning early gold trading as the precious metal climbs higher boosted by further dollar weakness and buying in both China and India. 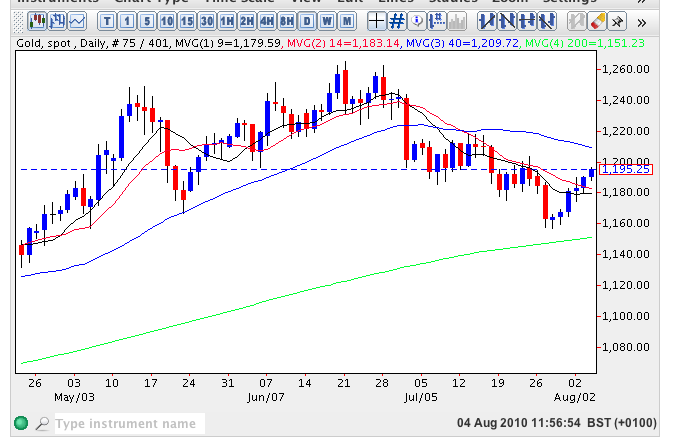 As such we are now approaching a potential resistance area between $1200 per ounce and $1217 per ounce to the upside but any clearance higher, combined with a break and hold above the 40 day moving average should add further momentum to the present upwards path for spot gold. Once clear of this region expect to see the spot gold price recover further and approach the high of June at $1265.05 in due course.